Take the Latest Quiz Online! Before you read the report, we invite you to test your own News IQ by taking the latest interactive knowledge quiz. The short quiz includes the same questions that were included in the national poll. Participants will instantly learn how they did on the quiz in comparison with the general public as well as with people like them. Far fewer are familiar with the specifics relating to the GOP’s victories. Fewer than half (46%) know that the Republicans will have a majority only in the House of Representatives when the new Congress convenes in January, while 38% can identify John Boehner as the incoming House speaker. On a different subject, 26% of Americans know that Android is the name of the Google operating system for smartphones. 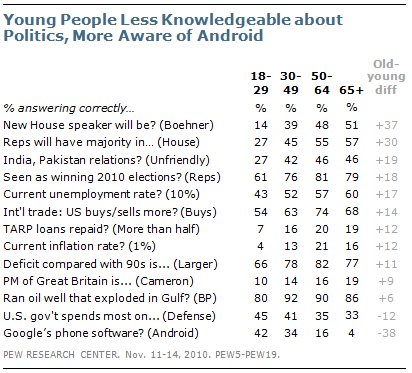 As in past news quiz questions about technology, there is a sizable age gap in awareness of Android. Far more people younger than age 50 (37%) than those ages 50 and older (11%) correctly identify Android as the Google phone’s operating system. There is broad awareness among most political and demographic groups that the Republicans did best in the midterms. But just 27% of those younger than age 30 know that Republicans captured just the House; 19% say that they won both the House and Senate while 42% do not know. By contrast, 45% of those ages 30 to 49, and majorities of those ages 50 to 64 (55%) and ages 65 and older (57%), answered this question correctly. Overall, 39% of the public knows that the government spends more on national defense than on education, Medicare or interest on the national debt. About one-in-four (23%) say the government spends more on interest payments and 15% say Medicare is the largest expenditure of these four alternatives. Government accounting estimates indicate that the government spends about twice as much on defense as on Medicare, and more than four times as much on defense as on interest on the debt. More Democrats (46%) than Republicans (28%) know that the government spends more on national defense than on the other items listed. 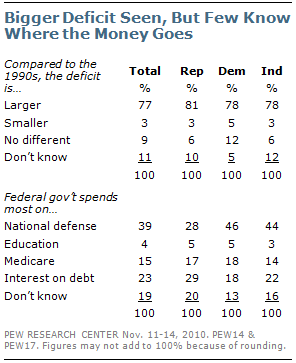 Republicans are as likely to say the government spends most on interest on the debt (29%) as on defense (28%). A plurality of independents (44%) know that the government spends most on national defense. 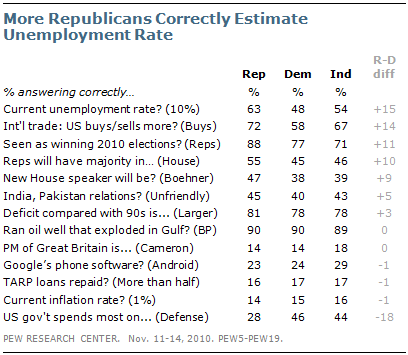 About six-in-ten Republicans (63%) correctly estimated the unemployment rate at about 10%, compared with 48% of Democrats. A wide partisan gap is also seen in awareness of the U.S. trade deficit: 72% of Republicans and 58% of Democrats say that the U.S. buys more good from abroad that it sells. Republican are also more likely to know than the GOP was perceived as winning the midterms and to know that the Republicans won a majority in the House. And while only about half of Republicans (47%) could identify John Boehner as the next House speaker, slightly fewer Democrats (38%) know this. Just 14% of those younger than age 30 know that John Boehner will be the next House speaker; about as many (19%) say it will be Nancy Pelosi, the current speaker. 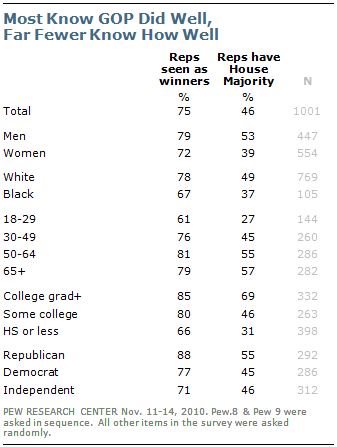 Among older age groups, Boehner is far better known. Just 27% of those younger than age 30 say Republicans will have a majority in the House, while the same percentage (27%) says that India-Pakistan relations are generally regarded as unfriendly. On each question, at least four-in-ten among older age groups answered correctly. However, 45% of those younger than age 30 know that the government spends most on national defense, about the same percentage as those ages 30 to 49 (41%) and slightly higher than those 50 and older (35%). And about four-in-ten young people (42%) know that Android is the operating system for Google smartphones, compared with 34% of those ages 30 to 49, 16% of those ages 50 to 54, and just 4% of those ages 65 and older. An alternative way of comparing quiz performance across groups is to look at the average results. 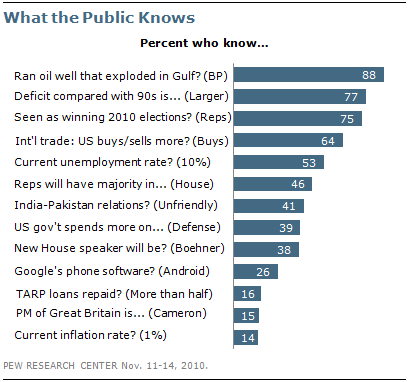 Twelve of the 13 items on the survey were used to form a knowledge scale for this installment of the Pew News IQ quiz. Each question is worth one point on the scale ranging from zero (none right) to 12 (a perfect score). This was a difficult quiz. Americans answered an average of five out of these 12 questions correctly. That means the public averaged fewer than half right answers (42%). Illustrating the difficulty of some questions, less than one percent of the public answered 12 correctly while 4% missed them all. College graduates did much better on average than those with some or no college experience. Those with college degrees answered an average of 6.8 questions correctly, compared with 3.8 on average for those with a high school degree or less education. College graduates did better on almost every question in the quiz. One exception was the item about government spending. Roughly four-in-ten of both college graduates (41%) and those with no college experience (38%) knew that the government spends more on defense than the alternatives offered. As described above, older Americans did significantly better than young people. Quiz takers ages 65 and older correctly answered 5.3 questions on average while those younger than age 30 averaged four right answers. Republicans did somewhat better than Democrats on average.